The wind farm projects of renewable energy auctions in Spain have been an opportunity for the growth of the wind turbines sector and a positive socioeconomic effect for Spain. These are some of the conclusions that emerge from the Wind Yearbook 2019, presented by the Spanish Wind Energy Association (AEE) in the framework of WindEurope Conference & Exhibition 2019 in Bilbao. This annual reference publication of the wind power sector presents the reality of wind power in Spain and the world. The main data of the wind sector are analyzed in the Wind Yearbook, highlighting the increase in the installation of power, thanks mainly to the parks of the Canarian quota that had the obligation to go into operation before December 31, 2018 and the parks of the renewable energy auctions, which have to be installed before 2020. Spain increased wind power by 392 MW last year, adding a total of 23,484 installed wind turbines. 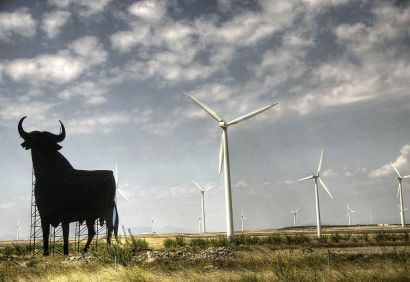 In this way, Spain continues to be the second European country in installed wind power and fifth worldwide. In total, in Spain there are 1,123 parks present in 807 municipalities, with 20,306 installed wind turbines, which cover 19% of electricity consumption. Likewise, there are 207 manufacturing centers in sixteen of the seventeen autonomous communities. One more year, in 2018, wind has been one of the main sources of generation of the Spanish electricity system with a contribution of 48,902 GWh, a value of 2.9% over 2017, and covered 19% of electricity consumed by the Spaniards. In the draft of the Integrated Energy and Climate Plan (PNIEC), the target for renewables has been set at 42% by 2030. Regarding wind, the goal is to reach 50 GW by 2030, which entails the installation of 2.2 GW of wind power per year. In Spain, investment in R & D is 5.2% of the total investment of the European Union, as indicated in the report of AEE. In addition, the yearbook analyzes the main objectives and challenges of R & D & I in the sector such as offshore wind energy as a lever for innovation, hybridization, storage, the reduction of CAPEX and LCOE, the power guarantee, patents and intellectual property as indicators of the innovation of a country and the sector, as well as the response to network requirements and the technical operation of the system. In this context, the work of the Technological Platform of the Spanish wind sector, REOLTEC, managed by AEE, is included. “The Spanish wind sector, integrating its value chain, is ready to face the next challenges with success. Without doubt, it will be necessary to achieve a framework of consensus and regulatory stability so that the sector can achieve its objectives. From AEE, we hope that this year marks the growth trend of renewables in our energy system to achieve the objectives set, “says Rocío Sicre, president of AEE. As in previous editions, the AEE report compiles the major global trends where it stands out that, for the third consecutive year, the available data indicate that in 2018 the world reinstated more solar and wind capacity than the sum of coal, gas and the nuclear power plants. The trend marked by the global energy transition is a reality, although renewable energies have a long way to go, being far from providing most of the electricity needs. In Europe, 74,000 million euros were invested in renewable energies in 2018, an increase of 27%, of which half were in wind installations. With the growth of 51.3 GW of world wind power in 2018, and reaching the cumulative total of 591 GW, wind energy covers more than 5% of the world’s electricity demand. 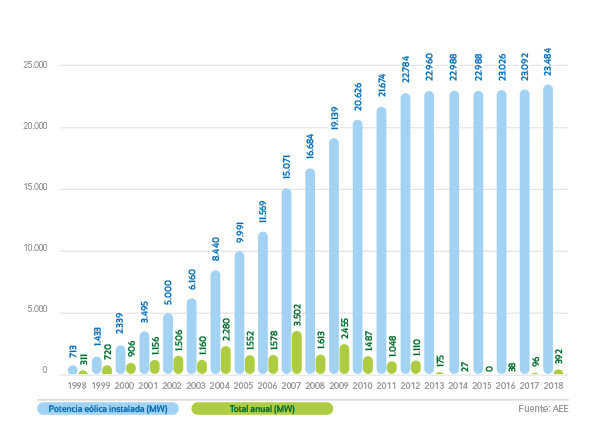 In the AEE Wind Yearbook, it is analyzed that long-term corporate contracts in Europe have grown strongly in 2018 as a tool to finance wind installations. During the year, the companies signed a record volume of energy purchase agreements (PPA), reaching 1.5 GW of new wind power financed through this financial instrument.